Learning to play the piano doesn't have to be difficult if you use the great apps. Many people who want to learn to play the piano are put off by the idea of spending long, boring hours learning music notes. If you are serious about learning to play the piano, the first thing you will need to do is put those negative thoughts behind and start with an open mind. Learning the piano doesn't require expensive lessons anymore or buying an expensive piano as well. If you are looking for an easy way out to learn piano, then there are some amazing apps to learn piano. Learn how to read music and chords, building technique and track your progress along the way. Here is the list of best iPad and iPhone apps that can be used to learn to play piano. Flowkey is one of the easy and best way to learn piano. The app allows you to learn piano with the songs you love. The application flowkey is a series of courses to help people from the very beginnings to the more able develop their piano skills. It is aimed towards any student wanting to develop their understanding and keyboard skills, and covers not only the skills to play the keyboard, but also the theory behind this, development of this as a musician, and a range of songs to work through. The display is very simple to navigate and understand, and the course is really interesting and versatile. Musilla Musical School is an application suitable for children 6 to 11 years of age in which they learn the basics of music. This beautifully presented app explores the adventures of the Mussila band on a musical journey. Help them find instruments, costumes and create your own music. The app is based on a music curriculum and the player progresses through skill building levels such as recognising instruments, instrumental sounds, rhythm and melodies. Join the Mussila band on their musical journey to help them find their lost instruments and costumes. The app allows you to record your own music and play piano notes. Simply Piano by JoyTunes is one of the widely used and most popular Piano learning application available on both iOS and Android platforms. Here you can learn from basics, like understanding the sheet music, to advanced level, like playing from both hands. This app is perfect for beginners as well as advanced players. You can personalize your workout as well as try your hand at tons of popular songs available in its library. Piano Maestro is another popular app by JoyTunes. It makes your learning fun by including the game type of interface. By progressing through chapters, you acquire Skill Points, that unlock many interesting features for you. Along with basics and tons of songs, it also gives you feedback on how you played a certain piece. With the Maestro app, you can also learn and practice chords which is very important if you want to become a full fledged pianist. There are thousands of animated Piano tutorial that teach you how to play this musical instrument. Online Pianist provides you many personalized lessons and songs to practice. You can even create your own collection of songs that you want to keep on practicing at later stage. This app is best when you already know the basics and want to try your hand at popular song pieces. 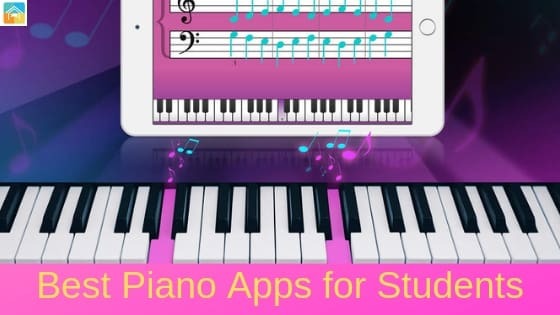 This is another most popular piano learning app available on the App store. Piano App by Yokee is very user friendly, easy to use, and you learn your lessons very quickly. You can play this with your friends. Pick a song and challenge them on who can play better. Numerous songs are added on a daily basis, which you will enjoy a lot. Piano Companion is a flexible piano chords and scales dictionary with user libraries and reverse mode with a flexible chord progression builder. If you can’t remember the name of a chord or scale, this app helps you to find it by keys. Magic Piano is a music-playing app that allows the students to learn the fundamentals of playing a piano. They can learn fine motor skills and rhythm by tapping the screen to recreate the melodies and chords of popular songs. Music teachers, directors, accompanists, and tutors can show students what a real piano score looks like, and teach them to read notes and rhythms. Sheet music for great classics and beginner's songs are also available in the app for the users to try it out. The users can listen in other player's performance and even arrange duet with random players from around the world. The students can earn achievements and badges for completing the levels. Yousician is an interactive music app that’s designed to really provide a fully-formed experience for just about everyone to better their instrument playing. One of the features that make Yousician stand out is its exhaustive choice of learning options. Use Practice Mode to slow songs down. This will help you build the coordination you need to play songs up to speed. You can also learn songs in parts; then once you've mastered each part you can try the whole song. The app is designed to give the player a chance to improve through practice and competition. When you’re starting, you can tackle the standard lesson structure, and as I mentioned, the lessons ramp up at a very comfortable pace. Students are ranked on their progress and can unlock the next level of their playing by accomplishing goals in a given category. Yousician is also appealing because it uses a color coded system for fingers and letter names. Baby piano is a music game for kids of 1 to 6 years old. Our kids game features 5 entertaining and educational activities for toddlers. Our learning game for girls and boys will allow little ones to develop creativity, an ear for music, hand-eye coordination, fine motor and attention. Musical Instruments for toddlers. Children can use a variety of instruments to perform – piano, drums, bells, flute, guitar, trumpet, harmonic and tambourine.